Due to busy work hours and tight schedules, a large number of parents depend on school vehicles for their children’s daily transportation to and from schools. But unfortunately, there are times when safety becomes an issue for children using school vehicles. This might be due to various reasons including the difficulty in managing a school bus fleet. 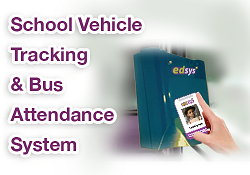 The School Bus Attendance software was created to tackle these issues with modern day technologies such as GPS and RFID. The best way to assure school children’s safety while travelling in the school vehicle is to employ the real-time GPS School Bus Tracking Software. It is a convenient solution that can be accessed through your personal computer or your mobile device. There are many benefits to this software apart from real-time location tracking. It helps in driver management, fleet management, reduces expenditure, and provides convenience for both parents and school management. As a system, the GPS School Bus Tracking Software works with amazing accuracy and reliability. For any software system to work as perfectly as imagined, the hardware has to be as good or better as the written software. The case is not different for GPS School Bus Tracking Software. Realising this, Edsys has used industry standard components for the software. GPS tracking system requires an RFID tag reader as well as a GPS tracking device. Normally, these are two separate devices that require individual installation and maintenance. It takes up extra space and time. Also, these bulky devices are not easily portable. There are a lot of people worrying about the quality of these types of devices. We do not recommend China made devices because of two reasons – availability of manufacturers representative locally for any maintenance or support and we want to ensure component we use have bigger say as it needs to integrate with our system. GPS tracker and RFID reader together provide School Bus Attendance. Normally, GPS tracking providers only supply tracker and that too, without the attendance functionality built in. This feature helps the system to notify which kid boarded and alighted as opposed to the normal bus arrival and departure notification. There are a lot of people worrying about the quality of these types of devices. We do not recommend China made devices because of two reasons – availability of manufacturers representative locally for any maintenance or support and we want to ensure component we use we have bigger say as it needs to integrate with our system. Compactly designed and conveniently sized, so that it doesn’t consume much space. Edsys’ hardware partner is Taximeter.in, the leading manufacturers of GPS Tracking Devices in India. Their industry leading hardware combines with the quality software, which has web and mobile applications, to create a truly remarkable School Bus Tracking System. You can learn more about the amazing ways in which GPS School Bus Tracking System is beneficial to schools, students and parents from trackschoolbus.com.